We've been back from our boating adventure for 3 days now. I'm slowly going through the many photos I took - deleting the crooked ones, of which there are many. It's hard to take a straight photo from a boat that's going up and down and sometimes sideways. We enjoyed sensational weather. Morning clouds gave way to curved blue skies in the afternoon. Early in the day, the water was soft as silk and mirror clear. Winds came up in the afternoons, but by then we were usually tucked into a quiet anchorage and very comfortable. The world is full of amazing things. Roaring Hole Rapids is the gateway to Nepah Lagoon. At slack tide, the rushing water seen above is flat as a mill pond and it's only then that small boats can enter the lagoon. The window for entering is about 10 minutes. Of course, once you enter, you have to stay until the next slack tide, about six hours. We didn't venture into this lagoon. A short boat ride from Roaring Hole is another lagoon with reversing tide rapids - Overflow Basin. We anchored Solitude alongside the opening, and stern tied her to shore to avoid being pushed around too much with the current. 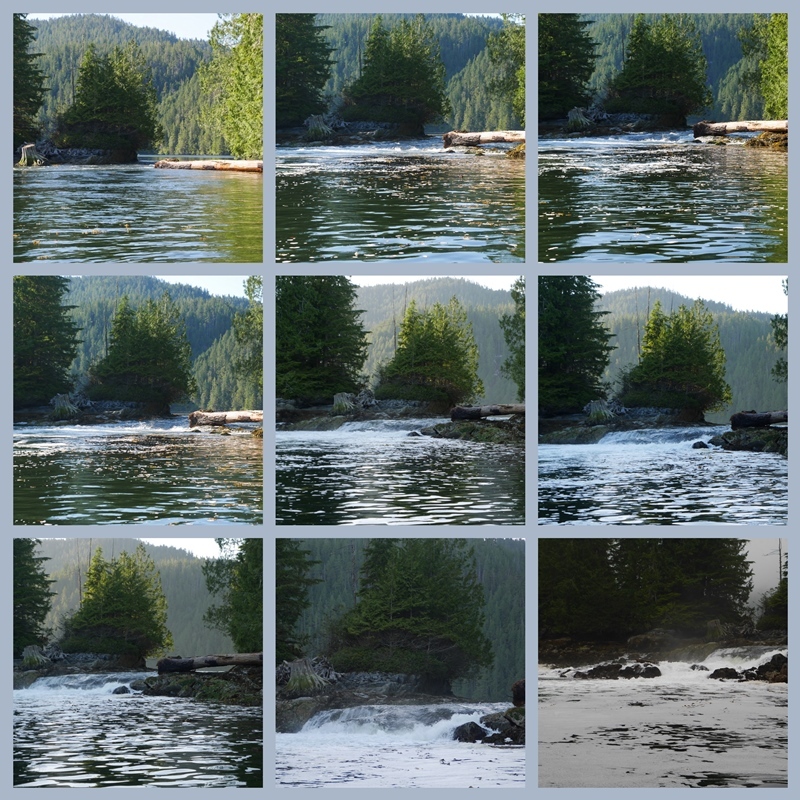 The first photo in the collage was taken at slack tide and as the day wore on and the tide dropped, the falls became quite dramatic. The last photo was taken at lowest tide, the next morning after another rise and fall of the tide. You might notice that the big log seen in the first photos is gone in the last. It was dislodged by the tidal flow some time in the night. 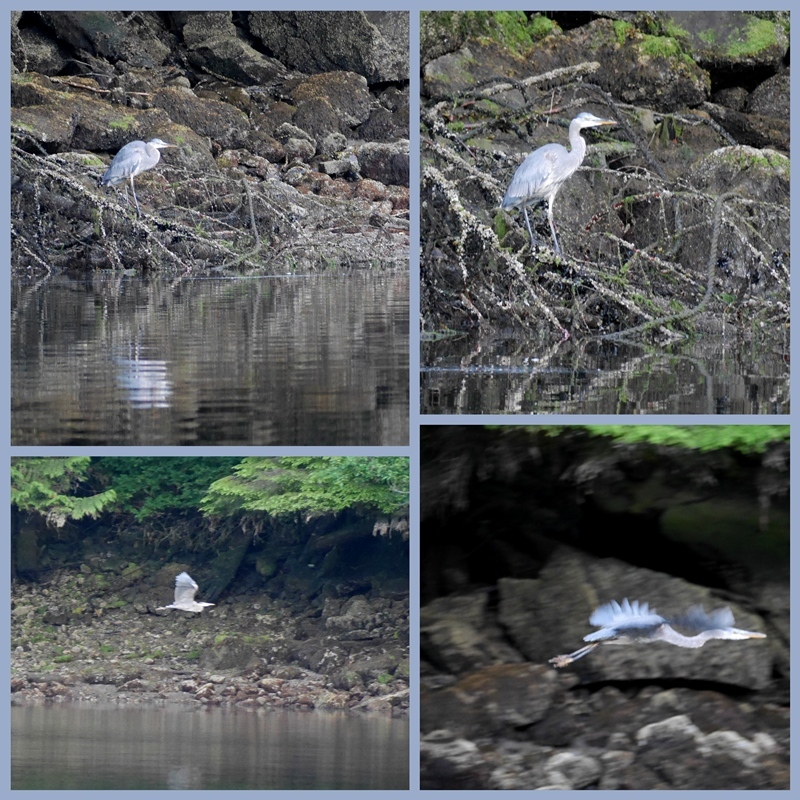 One night we took the dinghy out for a short tour around another bay and saw a siege of Great Blue Herons. Isn't that a great collective noun? I think the herons felt a little besieged as we got closer, and took off in a flurry of blue. I hope to do a few more posts about our trip - there are the bears to show you, and some First Nations villages we visited. I might intersperse them with other posts, depending on how things go. This next week I get to do child care for two grands and am looking forward to that. It's supposed to be a very hot week. I've made fudgesicles, and Tim and I tested them this evening. I think they'll do. We'll be doing lots of water play, I think. Tim's back to work tomorrow, and it's also our 41st wedding anniversary. Where do those years go? Happy Anniversary to you & Tim, your trip was certainly an excellent way to celebrate so many years of wedded bliss. The "time lapse" collage is wonderful, the power of flowing water is amazing. A siege of herons is a new one for me, I wonder if I'll ever get to use it? Hope so. You took some wonderful photos! Happy Anniversary! There is some really fabulous coastal scenery. Enjoy your childminding days! Beautiful world and this is the only way I would ever see it. The 10-minute window lagoon sounds so intriguing, but I would not like to feel trapped for six hours until the next window. Happy times ahead for you and the grands. I know you will find many ways to have fun and stay cool. Happy Anniversary! The time just marches on, doesn't it? But you have a sweet husband and a lot of fun doing things together. Love your photos. I have to straighten most of mine. (in Picassa or Photoscape) I don't like to delete photos and if I deleted all that were crooked, I wouldn't have any left! lol Happy Mosaic Monday! Happy anniversary, wishing you many more happy years together. This post was a real feast for the eyes, it was a joy to see that many places through your eyes. Thank you for sharing such beauty. Enjoy time with the grands. Loved seeing all of your fabulous photographs. Happy 41st wedding anniversary to you and Tim! Water and fudgesicles sound perfect for a hot week with grandchildren. Happy 41st. The anniversaries keep coming faster and faster. Happy Anniversary to you and Tim! 41 years is wonderful!! I got somewhat nervous when I saw those rapids, and was thankful that you didn't venture. What beautiful sights to behold, I must say. You are so lucky to see all that beauty and to share it with each other. Enjoy your time with the grands! Happy anniversary ... have a lovely day! Stunning scener; so peaceful -- That was an absolutely beautiful boat trip! Makes me yearn to be out on the water. We once forgot to check the tide tables and took our small bay boat down the Umpqua River for lunch . We were stuck for a few hours due to slack tide... thankfully, we had water and books. But more fun to look back on than it was at the time! I'm glad you were better boaters. Happy Anniversary. Oh my goodness what a beautiful place. 41years. Happy anniversary!!! These photos are spectacular. It is amazing to observe the changes that you were able to capture is such a short period of time. It makes one wonder in our daily rush how much we miss by not taking time to see and observe things around us. Dear Lorrie - I made a comment this morning on this lovely post which did show, but now seems to have disappeared. Also the last three people who commented after me from i.e (aspiritofsimplicity, Jojo, and Mrs Tiggywinkle) have all very strangely arrived in my email box!!! I am totally confused by this and I am sorry but I am not at all sure just what has happened. My goodness - those first 2 photos are wonderful - such a gorgeous scene. Thank you for taking us along. It looks like you had a wonderful time. Happy sorting through your photos. I'm still sorting through my Europe trip from a month and a half ago! Do you have a program to straighten your photos. It is easy to do. Have fun and have a great week and thanks for stopping by my blog this week. I like following your boating adventures! What fun it must be to go out for a weekend on your boat! Lorrie, That was very interesting about the tides. That was a bit log to be dislodged! The herons was a nice surprise. Thanks for sharing and enjoy the grands. Have a great week. Sylvia D.
Gorgeous photos...what stunning scenes! I am always in awe when I see herons...what a majestic bird. I think I would very much enjoy boating life! A real life adventure. Wonderful. Such peaceful times need to be savoured fully which I am sure you both did. But “took sailing lessons?” Surely you are both seasoned sailors? Beautiful photos, Lorrie! I enjoyed seeing your photos of this trip on Instagram. What peaceful and interesting ights you saw. The bear was exciting! Enjoy your grandchildren and have a very Happy Anniversary! I have never heard of these reverse tide water features … fascinating! Would I be correct to say that 10 minutes is not much of an opening for a boat your size? Congratulations on your upcoming anniversary!!! Enjoy your time with your grands - with our kids, water of any kind was a constant attraction. And I look forward to more pix from your adventures. Amazing photos. The water looks so inviting. I miss time out on the lake in our sailboat. Of course our views are nothing like this pretty wilderness, but water is soothing regardless.